I'm back from my first ever trip to Latin America! Which you'll already know if you read my last post. Spending a week in Belize only made me want to go to more Latin American countries. A few on my "To Go" list include Peru, Ecuador, Cuba, Guatemala, and Brazil among others. 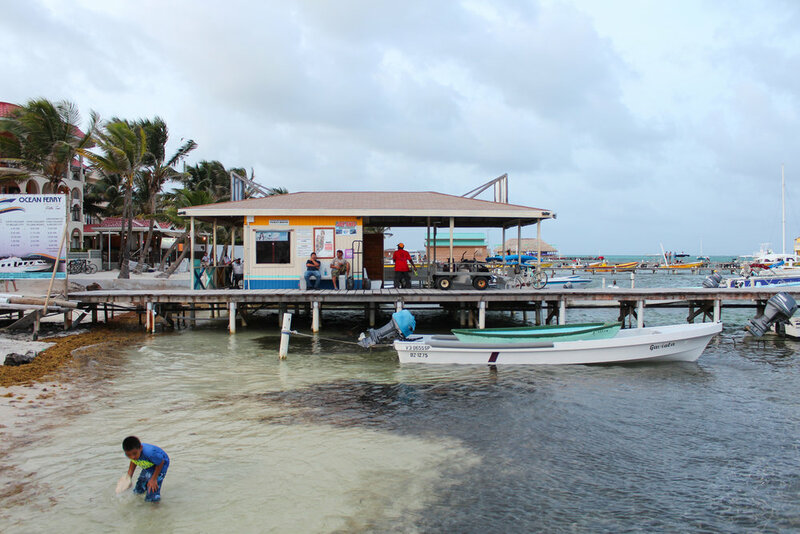 My time in Belize was limited to San Pedro, so exploring mainland Belize and Caye Caulker are on my list for next time as well. Now -- planning a trip to one of Belize's most beautiful islands? I've got quite a few recommendations for you. As a family we agreed Estel's Dine by the Sea was our favorite restaurant of the trip. It's right in "Central Park" (made the New Yorkers in us laugh), just a 2 minute walk from the water taxi dock. As the name suggests, the restaurant is on the waterfront. Its deck is topped with sand, which to me was a very exciting feature. The servers are incredibly friendly and the food is divine. We ate dinner here twice and I got shrimp both times (shocker). They were super knowledgeable about gluten, and were happy to tweak anything on the menu. Also, if for some reason you're looking for the best chicken fingers in San Pedro, look no further. Why do I know this? Although I wasn't able to try said chicken fingers (not gf), my dad and brother made it their personal mission to try chicken fingers at every restaurant we went to. Their unanimous verdict was Estel's. Unlike Estel's, which I'd recommend for breakfast, lunch, or dinner, Caramba is definitely more of a dinner spot. Apparently it's one of the island's most popular restaurants so obviously we had to check it out. If you're a seafood person, you are in for a treat. You pick what you'd like from the daily catch displayed out front and then they bring it in to be prepared. My parents went for lion fish and red snapper, and they were extremely impressed. Since I'm not a huge seafood person aside from shrimp (which I had eaten my body weight in) and salmon, I ordered pork tacos. To be honest, I was skeptical. Caramba is known for their fish, not their tacos. But you know what, they should be known for their tacos too because they were mouth-wateringly good! I couldn't not include a coffee recommendation. I mean, do you even know me? There's a super cute little internet coffee shop downtown (Central Park area) called The Coffee Bar. I ordered an iced latte and it was served in what's only comparable to a goblet. The inside is quaint and perfect for getting some online work done. If you're fancying something sweet afterwards, there's a French bakery on the island called Delices de France. I couldn't try anything (gluten problems, am I right? ), but I picked up an eclair for my mom and she said it was delicious. On the ice cream front, there's nowhere that compares to Paradice Cream. It's one of those places where when you taste the ice cream, there's no question that it's homemade. I can be sensitive to lactose in ice cream for whatever reason, but the ice cream here didn't give me a stomach ache once. To make our love for Paradice quantifiable, let me say we were given a punch card for buy 9 ice creams, get 1 free. We made it to our free ice cream easily. You have to do some water activities. Basically not optional. If you only have time for one snorkeling trip, I recommend the one to Hol Chan Marine Reserve & Shark Ray Alley. Shark Ray Alley alone is an experience like no other. You snorkel right beside nurse sharks. Normally bottom dwellers, the nurse sharks come up to the surface here because it's where fishermen used to dump fish remains at the end of the day. Now, the sound of a boat's engine is like a dinner bell to them. Don't worry - they're uninterested in you. Your guides will feed the sharks from the side of the boat while you snorkel a few feet away. Hol Chan Marine Reserve has a bunch of other underwater wildlife for you to observe, along with tons of coral. P.S. watch out for the fire coral -- I learned the hard way. 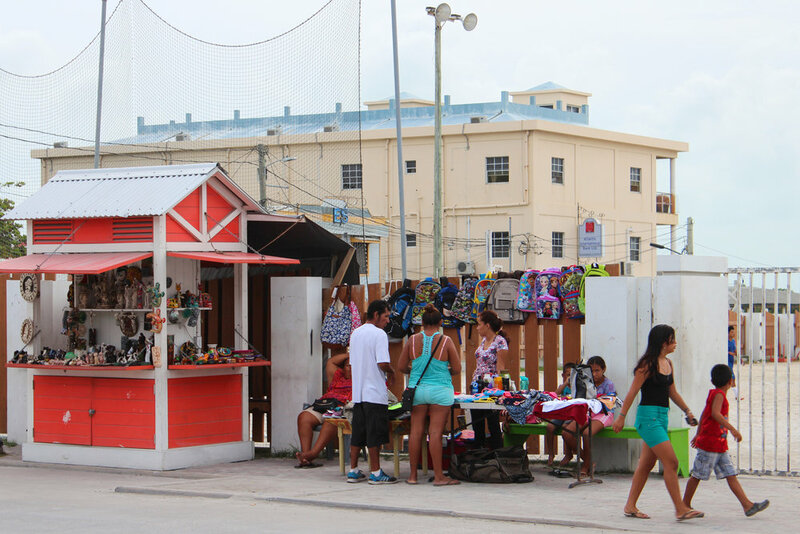 After a day of underwater exploration, shower and head to the island's Artisan Market. You'll find beautiful, handmade bits and pieces. I recommend picking up some woven pouches/coin purses. They make great gifts for friends and family! Once you've done your rounds at the market, take the time to walk around and soak up the local life. That's one of my favorite things to do in a new city or town -- just wander. San Pedro's most common mode of transportation is by golf cart, with biking coming in second. There are tons of places to rent both, but my Dad would like to add that you'll get a better deal renting from a local dealer as opposed to your hotel. 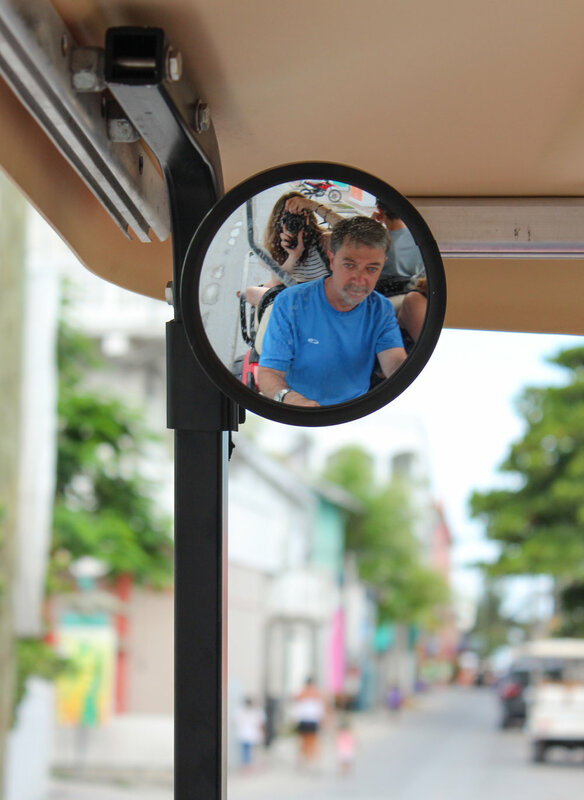 We opted for a golf cart, which we rented for the whole week, but you can also do daily or a customized timeframe. You're good to go as long as you have a US driver's license or an International driving permit. Pro Tip: even though it's a golf cart, carry your license on you because the local authorities stop to check from time to time. And of course, you can get most places on foot since San Pedro isn't terribly big. Like I mentioned earlier, I think it's one of the best ways to get to know the area. The official language of Belize is English so it's an easy destination if language barriers give you travel anxiety. San Pedro during off-season is cheaper and still beautiful. The idea of rainy season might scare some people off, but it's not 24/7 rain like you'd think. More like an hour or two every few days (think Florida-style rain). Exchanging money is no problem, but it's worth mentioning that US dollars are also accepted everywhere. That being said, make sure to double check if prices are listed in Belize dollars or US dollars because it makes quite the difference (1 USD = 2BZD).